Tsutenkaku is famous as a symbol of Osaka. The founder Tsutenkaku was built to resemble the Eiffel Tower in Paris in 1912, now is the second generation, which was built in 1952. The arcade mall, called Shinsekai, around Tsutenkaku is popular with tourists as an iconic area of Osaka. Called "Kita" nearby Osaka Station is the gateway of Osaka, it is a modern commercial area lined with office buildings and department stores. 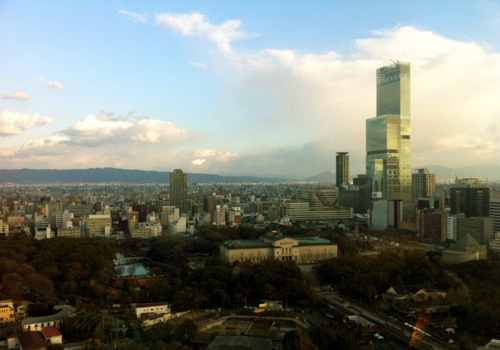 If you visit Osaka for business, because most of office is concentrated in the Kita, you can't feel a sense of Osaka. On the other hand, the southern area of Osaka city is referred to "Minami",is remained old fashioned downtown. The top of Tsutenkaku tower has a viewing platform, you can go up in the elevator. Because this elevator is very popular among tourist, you may have to wait about 30-40 minutes. Striking high-rise building in the immediate vicinity is the "Abeno Harukas". It is the tallest building in Japan. Tsutenkaku one of the other attractions is the "Billiken statue". 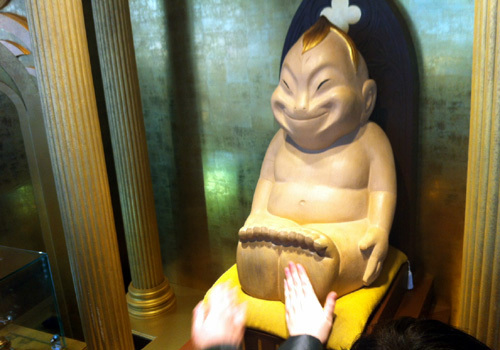 It is said that good fortune shall come for touching the soles of the feet of the statue. The icon of Billiken that was produced by American artists in the early 20th century, originally was in fashion as the god of good luck in the world at that time. 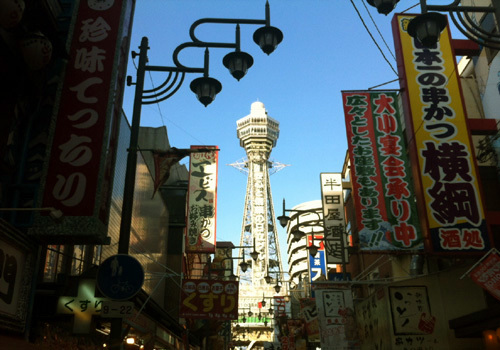 100 years ago,Tsutenkaku and Shinsekai was most modern spot in Osaka. Shinsekai means New World.